After having a nice bowl of Sarawak Laksa at Nam Chuan Coffeeshop today, something familiar caught my eye being sold at the same stall. 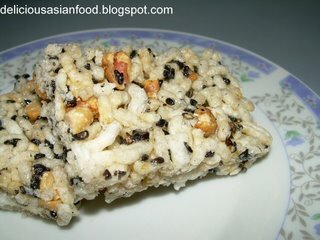 It’s Bee Pang (literally translated as “Rice Fragrant” in Hokkien but I would call it Rice Crispies). I have not seen it sold anywhere else here in Kuala Lumpur (yet), so I bought two packets. Bee Pang is actually sold in many places but not the type which is made in Kuching, Sarawak. 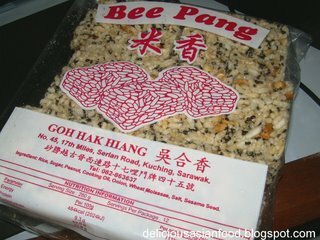 This Bee Pang which I bought is made in Kuching by Goh Hak Hiang of 17th Mile, Serian Road. 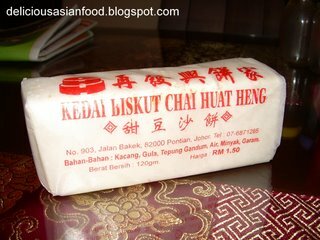 Something about the Bee Pang made in Kuching makes it taste better than those made elsewhere in Malaysia which I have tasted before. The Kuching variant as shown here is really crispy and light. The ingredients are rice, sugar, peanut, cooking oil, onion, wheat molasses, salt and sesame seed. Eack packet contains three blocks of Bee Pang. 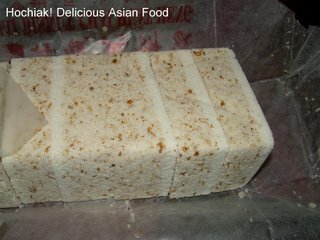 These blocks of Bee Pang has been pre-cut into smaller pieces measuring 5cm x 3.5cm x 1cm for easy eating. It tastes sweet. The onions (which I suspect is shallots) and peanuts give the Bee Pang a nice hint of fragrance and the Bee Pang which I bought here is pretty fresh. 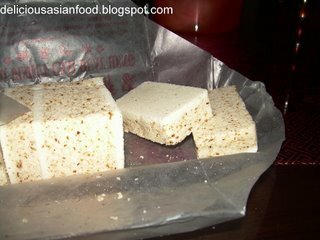 It doesn’t have that stale smell or taste associated with those rice crispies which have been left on the shelves for a period of time. It is also light and you can have a couple of pieces without feeling full. Bee Pang is sometimes used as a hand gift when visiting others. It is also popularly used as part of the “hantaran” or “dowry” during engagements or marriages amongst some of the Chinese community. Try it when you visit Sarawak or if you are in Kuala Lumpur, you can get it from the Sarawak Laksa stall at Nam Chuan Coffeeshop.